I love starting my day with fresh juice because I feel like I am starting my day in a positive and healthful way. There are numerous benefits to juicing; watch Fat, Sick and Nearly Dead to find out a few. We did and that is honestly what pushed us to invest in our beloved juicer. Sometimes my juice is very veggie dense and sometimes it’s more fruit oriented. I enjoy both but there is nothing like sipping on a sweet fruit juice on a sunny morning. One of my favorite concoctions? The Orange power juice. It’s super sweet and almost creamy but it is jammed PACKED with healing nutrients. 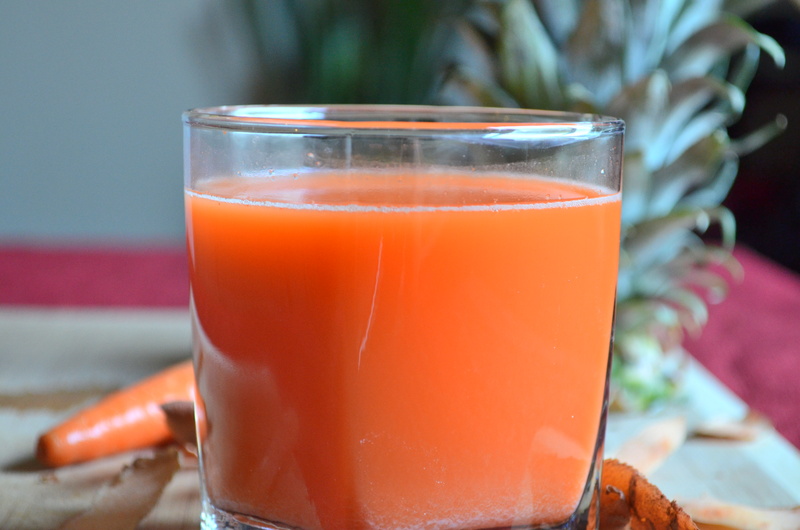 The juice requires carrots, sweet potato and pineapple. If you don’t usually juice sweet potato, you should. It adds a totally new dimension to juices. It’s creamy, sweet and almost feels decadent as you drink it. Best part? Sweet potatoes are amazing for you and should be getting more credit. I really do not understand how white potatoes caught on as a staple food but not sweet potatoes. If you only eat sweet potatoes at Thanksgiving drenched in brown sugar and covered with marshmallows, you are missing out! Sweet potatoes are naturally sweet and have so much flavor. They are also really great for your health. When I told a friend that I love juicing sweet potatoes, she was surprised; she didn’t believe they could be juiced because of their texture and she was concerned that they weren’t good for your health if juiced. She couldn’t have been further from the truth. Juicing sweet potatoes gives you access to quercetin, a phytochemical that might help prevent cancer. Quercetin stops the progression of tumors associated with skin cancer and has a positive impact on thyroid cancer. Quercetin may also be therapy for people at risk for Alzheimer’s disease. You can buy quercetin pills or add sweet potatoes in your diet. Sweet potatoes are also the greatest source of beta-carotene (beating out even carrots!). They are a good source of carotenoids which boost the immune system. Want to keep your eyes healthy? Juice a sweet potato. A small sweet potato can contain 369% of your daily need of vitamin A which plays an important role in the health of your eyes. They contain vitamin C, potassium, calcium, and are a great source of fiber and vitamin E.
I probably do not have to convince you that eating and juicing carrots is amazing for your health. However, if you are not on the carrot bandwagon, you should know that carrots are great for you! They contain a heavy amount of beta-carotene, vitamins and minerals. Carrot juice is a rich source of potassium and since they are naturally sweet, they can add flavor to many juicing recipes. According to juicing-for-health.com, carrot juice is a natural diuretic and can act to remove excess fluids from the body which is really helpful to women who experience water retention. 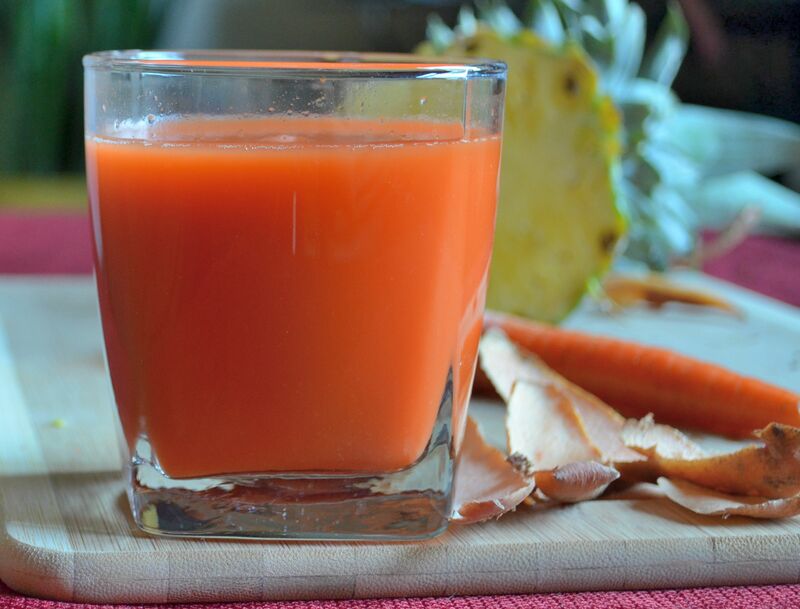 It’s simple: Juice carrots and be happy and healthy. Pineapples are freaking delicious, juicy and have a sweet yet semi bitter quality. When you juice them, their powerful flavor really stands out. Not only are they scrumptious but they are so good for the body! They contain bromelain which is an anti-inflammatory enzyme and aids with digestion by helping the body break down proteins. Did you bump the corner of the coffee table last night and have a bruise? Drink some pineapple juice because it helps heal bruises and can help with arthritis pains. Feeling sluggish or tired? Drink pineapple juice! It contains thiamine and B6 which helps convert carbs into energy. Studies have shows that vitamin B6 stabilizes blood sugar. For all my vegan and vegetarian friends, thiamine belongs to the vitamin B group which many struggle obtaining the daily recommended amount. Pineapple juice is packed with vitamin C and one 8 ounce serving contains over 75% of the daily recommended amount of vitamin C which boosts the immune system. It’s also rich in potassium. Get healthy with fresh pineapple juice. These three ingredients are great for you and fairly inexpensive. If you run or experience muscle soreness like I do, this juice can save your body thanks to all the potassium that each ingredient naturally carries. Try this juicing combination today and feel like you are drinking dessert but are in reality being so so so good to your body. Juice the first three ingredients. Strain if needed. Mine always needs it. If you are like me and the juice is too rich or sweet, feel free to add water. If you like the richness of the juice as is, like my hubs, than skip the water and treat yourself! Oooh I’m so trying this one, because, NO, I haven’t juiced a sweet potatoe yet. Though I started daily morning juicing for the same reason as you. GREAT movie. I however, try to fit as many varieties of veggies as possible and go low on the fruits because they are so much easier for me to eat raw, where as I struggle with the raw veggies. Let me know how you like it! It’s so rich and filling and I think you will really enjoy it. Usually I am more into juicing veggies also but every once in a while all I want is natural fruity awesomeness.